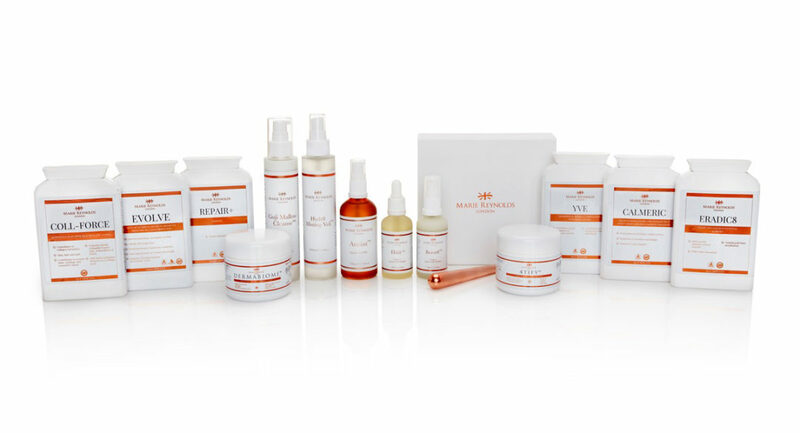 Marie Reynolds is one of the most sought after skin experts in the UK. I’m lucky enough to have had a few treatments with her including her superb Master Lift. I was very excited when she brought out a few skin products earlier this year and they were as wonderful and innovative as you would expect from a holistic expert such as Marie. And now it’s even more exciting as she’s expanded her range of topical products and has now also included beautifying supplements to really up the ante. A very light cream applied to dry skin and then massaged in with wet hands. Removes make up beautifully and leaves the skin soft and nourished without being at all rich. Antioxidant goji and acai berries help lock in moisture, reduce inflammation and improve elasticity. A hydrating spritz with hyaluronic acid that calms, soothes and protects. She’s now added another amazing mask to her arsenal. Filled with amino acids and phytonutrients, as well as antioxidants and a prebiotic, this powerhouse of a mask literally feeds your skin. It reduces damage from free radicals and leaves your skin more hydrated and visibly brighter. Both of these masks have the advantage of leaving your skin silky smooth. This light but extremely effective facial oil is filled with essential fatty acids, antioxidants and vitamins to support and feed the skin. It’s particularly good for scars and stretch marks and softening dry skin. It has one other trick up it’s sleeve and this is one of my favourite things about the whole range. By mixing Anoint with Dermabiome, it creates a probiotic exfoliation that leaves your skin as smooth as a pebble and as soft as the day you were born. In fact I could not believe how incredible my skin felt and kept stroking my face for the rest of the day. And you don’t even have to leave it on for long. Massage the mixture onto your skin for 2 minutes and voilà. Her beauty supplements are equally incredible and I will write about them in the next article.